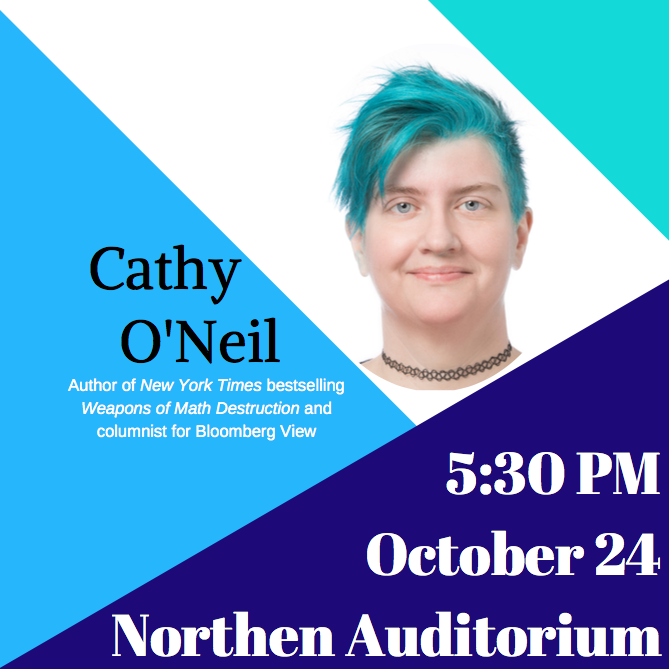 Cathy O’Neil, author of “Weapons of Math Destruction,” will give a public lecture on Oct. 24 at 5:30 p.m. in the Northen Auditorium on the Washington and Lee University campus. O’Neil’s talk, which is free and open to the public, is titled, “How Big Data Promotes Inequality and Threatens Democracy.” O’Neil will visit classes and join a small group of students for lunch colloquium discussion for students the same day. O’Neil received her Ph.D. in math from Harvard University and was a post-doctorate at Massachusetts Institute of Technology. She taught at Barnard College and Columbia University, where she launched the Lede Program in Data. She has since moved into the private sector with her firm ORCAA, an algorithmic auditing company. “Her work is a wonderful and important blend of mathematics, public policy analysis, science and ethics. It embodies the best of liberal education,” said Rush. O’Neil’s talk is sponsored by the Center for International Education, Office of the Provost, W&L School of Law, Mathematics Department, Andrew Mellon Foundation, the Frances Lewis Law Center and the Department of Politics.